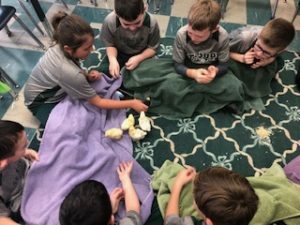 3rd grade’s journey began 3 weeks ago with the arrival of seven chicken eggs and an incubator. 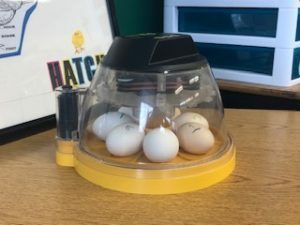 For 21 days, we excitedly watched as the incubator turned the eggs throughout the day, and used the process of candling to witness the growth of our baby chicks inside the eggs. 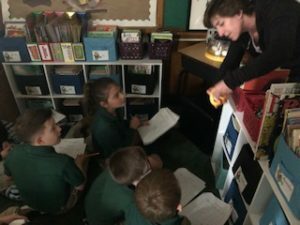 Each morning we consulted our chart to see what growth was happening inside the egg as we learned, played and went throughout our school day. We were amazed that something that began as just a few blood vessels, soon had a heart, heart beat, feathers, etc. On Monday (4/1) afternoon of this week, our first pip (small hole in the shell) appeared and our excitement grew. 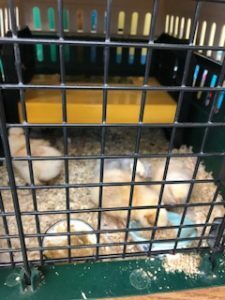 We knew that soon there would be some fluffy little friends joining our classroom! When we arrived at school the next day, there were two little chicks to greet us. We were so lucky, a little later that morning, to be able to actually see a chick hatch from its shell right before our eyes. Our fourth and final chick arrived late Tuesday afternoon after we had all gone home for the day. We have had so much fun sharing our new friends with the other classes in the school. 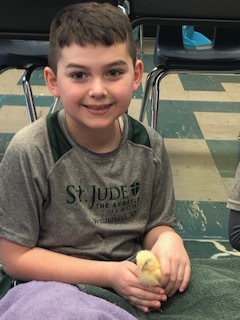 We taught all the kids how to carefully hold our little babies, and shared the video of chick #3 hatching with the whole school at morning assembly. What a great thing to experience while we are awaiting the “New Life” of spring and Easter! 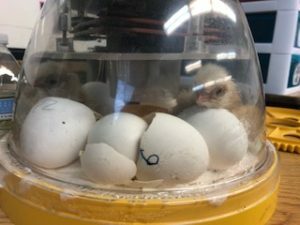 A huge thank you to Mrs. Stacie Gonzalez for letting us use her incubator and for providing the eggs.